Converse All Star black high tops, the classic American sneaker. Last week, the other shoe dropped on Converse. I’m talking about a canvas sneaker that generations of athletes insisted on wearing to “swoosh” the net on the basketball court. The high-topped canvas and rubber sneaker with a Chuck Taylor star patch on the ankle went bankrupt. Converse, the manufacturer and seller of more than 575 million pairs of Chuck Taylor All Star basketball shoes, has filed for financial protection under Chapter 11 of the U.S. Bankruptcy Code. Converse is reportedly more than $180 million in debt. The 93-year-old company that invented basketball footwear will close its three North American manufacturing plants and All Stars of the future will be made in Asia. Chuck Taylor All Stars were the last great American sneakers because they were the last major sneakers totally made in America. When I grew up in the 1940s, making the basketball team in high school was a big obsession for both boys and girls. But if you failed, you still had a fresh pair of All Stars you bought for $8. Buying sneakers was an occasion. You spent months hustling odd jobs to earn the money to buy the sneakers. They came in black or white, high-top or low-top. Put on a pair of white stretch sweat socks and a pair of black high-top Chuck Taylor All Star sneakers and you were ready for your jump shot. There were other sneakers on the market called US Keds and PF Flyers, but wearing other sneakers in gym class led to harassment and anguish. You wore your “Cons” for Converse. Converse introduced All Stars in 1916 and made a series of style changes. In 1936, the shoe took on its current design. White low-tops were introduced and they caught on, but we still wanted black sneakers because they needed less washing and didn’t show the dirt. When I first moved to Silicon Valley, one of my neighbors was Gib Ford, the Converse field representative who later became vice president of sales and finally CEO before he retired. Gib was the head salesman when Americans became interested in the fitness craze and the running boom. But the American consumer wanted something new and Converse couldn’t get away with the same old-same old. Customers starting wearing other brands. The company was bought out by Allied Signal, and Converse started using leather because it provided more support and stability. I still have a black pair of coaching shoes with leather tops and rubber soles. When Nike, Adidas and Reebok went overseas, those companies started promoting and giving away shoes to colleges and pro teams. Saddled with American factories, Converse couldn’t compete with the snazzy stuff that came from overseas. 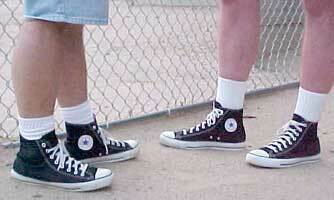 Fashion is fickle and Chuck Taylor All Star sales went down the tubes. Clyde Noel is a longtime contributor to the Los Altos Town Crier.